Nano and Micro Engineered Membrane Technology is about Nano and micro engineered membrane technology, an emerging new technological area in membrane technology. Potential applications cover a broad spectrum of science, such as micro and nano filtration, gas separation, optics and nanophotonics, catalysis, microbiology, controlled drug delivery, nanopatterning, micro contact printing, atomisation, cross flow emulsification, etc. A brief overview of filtration membranes and pore structures is presented in chapter 1 and in the subsequent chapter 2 an overview is presented of conventional micro perforation methods, like laser drilling, electroforming, precision etching etc. With micro engineering techniques (chapter 3), originating from the semiconductor industry, it is relatively easy to downscale and form submicron pores (down to 100 nm) using photolithographic methods, with e.g. contact masks and wafer steppers. In chapter 4 some elementary fluid mechanics related to fluid flow in conducts and single and multiple orifices is presented covering analytical methods as well as computational fluid dynamics. Much effort has been put in strength and maximum pressure load analysis (chapter 5) of perforated and unperforated membranes. New analytical expressions were obtained that were verified by a number of computer simulations and many experiments. A separate chapter (chapter 6) has been devoted to the pioneering work of manufacturing polymeric perforated membranes because of its potential future economical impact. Large scale microfiltration applications on e.g. skim milk and lager beer are presented in chapter 7, whereas in chapter 8 a micro scale Lab-on-a-Chip microfiltration/fractionation demonstrator is discussed. 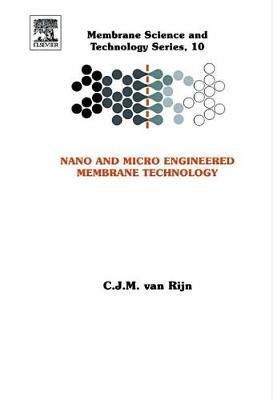 Nanotechnology and nano engineered membranes is the fascinating topic of chapter 9, with typical examples as nanopatterning, nanophotonics and nanomembrane technology. This book closes with novel pioneering applications on atomization (chapter 10) for deep pulmonary inhale and cross flow emulsification (chapter 11) for the manufacturing of e.g. functional foods and nano/micro emulsions.